This post is Sponsored by Zappos and Kamik. All the opinions expressed here are our own. The fall season rolls in, the leaves start falling, the temperature begins to drop, and we start transitioning into a more suitable wardrobe. For this post, we partnered w/Zappos x Kamik shoes to showcase their cute, fashion-forward boots for both women and children. We decided to wear these boots during one of our favorite seasonal activities; pumpkin picking. 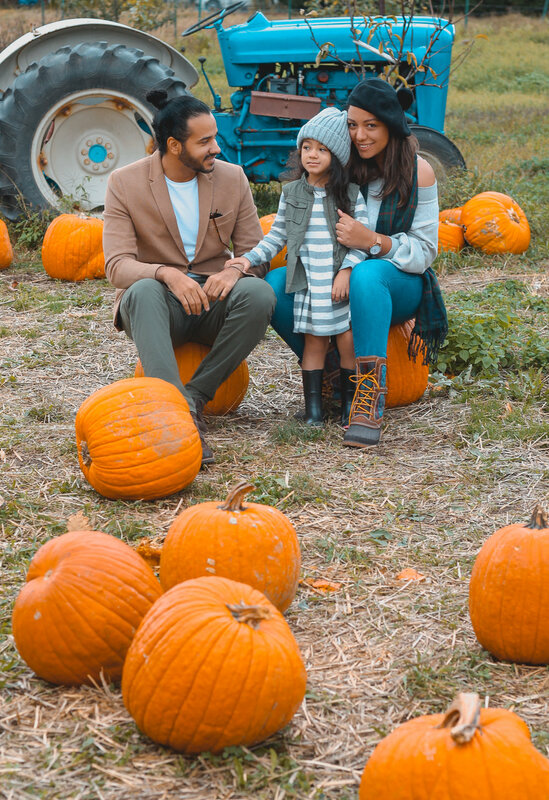 Outdoor family activities like pumpkin picking never looked more stylish, thanks to these Kamik boots for Chanell and I. One surprising fact is that this company is family ran and operated with an emphasis on tradition and craftsmanship. Another great thing about this brand is that they are environmentally friendly and their comfy boots are ideal for any outdoor weather. In all honesty, all these wouldn't be possible if not for the fast and free shipping from Zappos. Due to our crazy schedule and other engagements, we ordered these boots days before Halloween, but they arrived in time for us to go pumpkin picking in style. Now, I would like to provide a few tips when choosing the perfect footwear for those busy, modern moms that have an active lifestyle like myself. Brand - Choose a brand that has a rich history of creating great products, preferably like Kamik’s environmentally sustainable approach. Don't compromise - With Kamik footwear, you have the best of both worlds with regards to comfort and style. Experience - Shop at an online site like Zappos where they offer excellent value for your purchase, along with outstanding service and free goodies to further enhance your overall shopping experience. This Halloween season has been very active for our family. Outdoor activities like visiting a local pumpkin patch was indeed a rewarding experience for all of us. We would like to express our thanks to Zappos x Kamik footwear for partnering w/us on this awesome blog post.